Let’s begin with the Toro 51619 Ultra Electric Blower/Vacuum with Metal Impeller—one of the lightest among the ones on this list. Indeed, coming in at a mere 8.5 lbs, this leaf vacuum is sure to be easy to carry and move around and use, making maintenance of your lawn and/or garden truly easy and enjoyable. The useful features of the Toro 51619 Ultra Electric Blower/Vacuum with Metal Impeller don’t stop at its being quite handy. This leaf vacuum comes with several other useful features that make keeping your lawn and/or garden as beautiful as possible easy as well as enjoyable. First, and foremost, the leaf vacuum comes with a variable speed 12 amp motor that can blow out air at any speed up to 250 mph, enabling you to set the device to a low speed in order to clear hard surfaces and clean up tight areas while avoiding making an even bigger mess and decreasing the device’s effectiveness. The device can also maintain a maximum air volume of 410 cfm, enabling you to easily move a substantial volume of debris around or out of your yard. If you’d like to have control over the volume of air generated by the leaf vacuum, it comes with 2 different air concentrator nozzles that allow you to adjust the air volume the device generates: the power insert enables you to move debris into ‘wind rows’, which creating piles easy; while the concentrator insert enables you to move debris out of cracks and edging, which makes the device truly effective. The main tube would be most effective in moving debris away from your house and/or yard. The rest of the leaf vacuum’s useful features are: quick-release latch that enables you to easily convert the device into a leaf blower and then a leaf vacuum once again; metal impeller, which not only enables you to use the device to mulch debris, but also ensures the device itself can last for several years; and hook for convenient storage of the device’s electrical cord. The only minor complaint aired about the Toro 51619 Ultra 12 Amp Electric Blower/Vacuum with Metal Impeller’s is that customers may find it quite similar to a toy or a giant hair dryer, according to consumers who own models of this leaf vacuum. Generally, however, most of the customers were satisfied with their models. Moreover, the leaf vacuum received a rating of 4 and a half stars out of 5 on Amazon. Coming in at a mere 4.7 lbs (6.9 lbs with the battery included), the Black and Decker LSWV36 40V Lithium Ion Sweeper/Vac is lighter than the leaf vacuum reviewed previously and many of the best leaf vacuums currently available in the market, leaving very little doubt in anyone’s mind that the former is indeed easy to carry and move around and use, too. 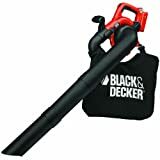 The feature of the leaf blower that made it so light is its powerful, cordless, and rechargeable Black & Decker 40-volt Lithium Sweeper/Vacuum (Model LSWV36). Compared to gas-powered engines, this power source is lighter, produces less noise and smoke; and can run and last longer. The useful features of the Black and Decker LSWV36 Sweeper/Vac don’t stop at it being surprisingly handy. Like the leaf vacuum reviewed previously, this leaf vacuum comes with a wide array of useful features that make it a truly effective lawn and garden maintenance tool. These features are: ‘Power Command’ function that controls speed for maximum run time or maximum power, blower tube with built-in scraper, which enables you to easily loosen and dispose of tough debris, like matted leaves; and design that makes it easily convertible into a leaf blower and then back into a leaf vacuum, which makes using the device truly convenient. The rest of the leaf vacuums useful features are: ability to generate a maximum air speed of 120 mph, assuring you that the device can make quick work of moving even tough debris around and/or out of your yard; fast recharge time of more or less 1 hour; convenient, easily attachable half-bushel bag; soft-grip handle; and operating instructions. While this appears quite a useful leaf vacuum indeed, a small number of consumers have noted a few drawbacks to this device. Their complaints are: the impeller is made of plastic, making it unlikely this leaf vacuum’s part can last long, which means it’s likely the leaf vacuum itself can’t last long either; the device itself isn’t as powerful as expected; the air intake was designed on the side of the device, making using the device itself somewhat awkward; the half-bushel bag is small. Nevertheless, the leaf vacuum received a rating of 4 stars out of 5 on Amazon. It is available for sale for just the unit, while you can also get this with the 40v battery included. Last, but certainly not the least, is the GreenWorks 24322 DigiPro G-MAX 40V Cordless 185MPH Blower/Vac with 4ah Battery and Charger—the lightest leaf vacuum on this list. Coming in at just 5.6 lbs (16 lbs when shipped), anyone would be hard pressed to find another leaf vacuum lighter than this one. While the GreenWorks 24322 DigiPro G-MAX 40V Cordless 185MPH Blower/Vac with 4ah Battery and Charger is surprisingly light, it doesn’t fall short in terms of power. This comes with a brushless motor powered by a powerful, long-lasting, and rechargeable G-MAX 40-volt lithium-ion battery system that not only can generate 340 cubic feet of air per minute (CFM) at a maximum variable air speed of 185 mph, but also 30% more torque than many of the other leaf blower vacuums currently available in the market. The features of the leaf vacuum that make it a truly effective lawn and garden maintenance tool don’t stop at being handy and powerful. The design of the device itself plays an important role in making it truly effective. To be specific, the motor’s brushless design enables the device itself to deliver more power, as well produces less noise and vibration, compared with leaf vacuums that come with motors with different designs, e.g. gas-powered motors. The motor’s design also improves the efficiency of the device’s battery and makes the motor itself exceptionally durable, effectively extending the life of the device itself. The rest of the leaf vacuum’s useful features are: simple electric start switch, over-mold grip handle and wrap-around handle, both of which make using the device comfortable; LED battery level indicator, which makes it easier for you to keep tabs on the battery’s life; quick charge time of 1 hour and 20 minutes; 10:1 mulch ratio; charger; large bag; and operator’s manual. 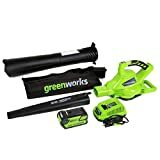 Despite the several useful features of the GreenWorks 24322 DigiPro G-MAX 40V Cordless 185MPH Blower/Vac with 4ah Battery and Charger, customers have aired minor complaints about this leaf vacuum. They say to convert it from leaf blower to leaf vacuum and then back again is a hassle, the device itself isn’t as powerful as hoped, and the charger is a pain to use. The leaf blower, however, received a rating of 4 stars out of 5 on Amazon, where it’s currently being sold with free shipping. Perhaps we should rethink the saying ‘if it (ain’t) broke, don’t fix it’. If we had decided to rest on our laurels and be content with the first leaf blower, we now wouldn’t be enjoying the improvements to this lawn and garden maintenance tool. Given comprehensive reviews of 3 of the best leaf vacuums currently available in the market, we hope to help you find the cutting-edge lawn and garden maintenance tool that will be the best for you. #3 Choice – GreenWorks 24322 DigiPro G-MAX 40V Cordless 185 MPH Blower/Vac with 4ah Battery and Charger… can you suggest a longer lasting or better battery then the one on this product?